Wednesday, March 6, 2013 Despite an optimistic view of health in their communities, significant portions of the U.S. population are not convinced that communities provide sufficient access to key resources for good health, while 60 percent of Americans say online information is important to their health, a new survey from The Atlantic, in collaboration with GlaxoSmithKline (GSK), finds. The national survey, conducted by Penn, Schoen & Berland from Jan. 12-20, 2013, found a strong majority of Americans place a premium on health care providers and environment as being primary drivers of their community’s health. The phone survey of 1,004 individuals found that Americans—lower-income individuals, defined as those making less than $50,000 in household income, in particular (55 percent)—view doctors and hospitals as primarily responsible for ensuring good health in a community. The Atlantic has partnered with GSK on a national initiative to examine the barriers and identify opportunities to build healthier communities in the U.S. The program, “A Conversation on Community Health” consisted of a series of events in U.S. cities to explore what it means, and what it takes, to be a healthy community. This poll builds on the learnings from those events by focusing on citizens’ perspectives. The poll also found nine of 10 Americans consider themselves to be in good personal health and 81 percent said the health of people in their community is good. This finding is in stark contrast to recent research on the health status of America, including one-third of U.S. adults who are obese[i] and 26 million adults and children who have diabetes. [ii] Additionally, while the majority of Americans believe their health status has not changed recently, 26 percent say their health has declined and cited worsening economic circumstances as a critical factor. While Americans believe a variety of community factors are very important to their health such as good air and water quality (87 percent), regular access to doctors and dentists (82 percent), healthy food choices (81 percent), and nearby hospitals and urgent care facilities (74 percent), the poll found significant unmet needs for the most underserved in this country with those who most value these community health resources having the least access to them. Minorities[iii] and urban, low-income Americans in particular are less convinced of their access to clean air and water, nearby hospitals, green spaces, and safe housing and healthy food choices. For example, 89 percent of low-income Americans cited good air and water quality as being very important to their health, yet only 58 percent say they have a great deal of access to these environmental and community services. Additionally, 84 percent said regular access to doctors and dentists was very important to their health but only 66 percent feel they have a great deal of access to them. The survey also found there continues to be a rapid evolution in how technology is changing the way people access healthcare. The survey suggests Americans want technology to become a bigger part of the healthcare system with 64 percent using online health resources and 94 percent of those saying the health/medical information they find online is important to their health. And yet only 12 percent of respondents have emailed or sent a text message to a physician regarding a health question. “It’s interesting to me that a third of people have never looked up their health condition or symptoms on the Internet, while nearly 90 percent have never emailed or texted with their doctor,” Dr. James Hamblin, M.D., TheAtlantic.com’s health editor, said. “That last point may be a slippery slope in terms of a physician's limited time and work-life balance, not to mention limited compensation structures for that kind of communication, but it seems to me one area where the healthcare community could achieve a happier medium. Imagine being able to ask your doctor a quick question or check in with him or her directly without going all the way to an office visit." The younger population, in general, are far more prone to embrace and utilize health information technology; however, this group also tends to place greater emphasis on removing face-to-face interaction with healthcare professionals and self-diagnosing their conditions. Click here to view an infographic on the poll results. Join the conversation on Twitter @GSKUS or @Atlantic_Live, #HealthyCommunity. 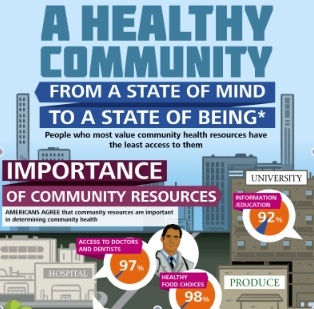 The Atlantic-GlaxoSmithKline National Community Health Survey was a quantitative phone poll of 1,004 individuals in the U.S. general population on the issue of community health conducted by Penn, Schoen & Berland from January 12-20, 2013. Questions asked of the full sample had a margin of error of plus or minus 3.09 percent. Full results are available at http://atlanticlive.theatlantic.com/pr/CommunityHealth/PollResults.pdf. GlaxoSmithKline plc [LSE/NYSE: GSK] – one of the world’s leading research-based pharmaceutical and healthcare companies – is committed to improving the quality of human life by enabling people to do more, feel better and live longer. For further information go to us.gsk.com, follow us on twitter.com/GSKUS or visit our blog (www.morethanmedicine.us.gsk.com/blog/). Penn Schoen Berland (PSB) is a ‘Global Research based Strategic Communication Advisory’ that brings the lessons learnt from its campaign trails into the boardroom to help companies negotiate some of their toughest corporate image & corporate affairs challenges. For over thirty years PSB has used research to leverage unique insights about public opinion, to give our clients a competitive edge. PSB serves Fortune 100 Corporations, leading Hollywood Studios and has helped elect over 30 Presidents and Prime Ministers around the world. PSB is a part of Y&R Brands and WPP (NASDAQ:WPPGY); more information is available on www.psbresearch.com. [i]The Centers for Disease Control and Prevention (CDC). Overweight and Obesity-Adult Obesity Facts. http://www.cdc.gov/obesity/data/adult.html. Accessed Feb. 26, 2013. [ii]American Diabetes Association. Diabetes Basics-Diabetes Statistics. http://www.diabetes.org/diabetes-basics/diabetes-statistics/. Accessed Feb. 26, 2013.